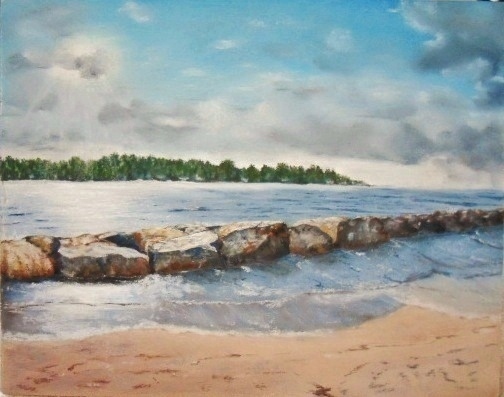 This was one of my first seascape paintings, done two years ago. The painting, The Jetty, was the view out our kitchen window. It was a perfect place to live and be introduced to the locals, we found out that it was a constant hub of activity. We would watch the comings and goings of the local fishermen/lobstermen coming into the Jetty after a long day out to sea; each morning we’d hear a slapping sound, and figured out seals played in the Jetty slapping their fins – how cool was that; sea gulls would stomp on our flat roof top looking for Cohog clams (these are very large clams); clam diggers in the freezing ice-cold would dig for clams at low tide; and to our amazement horse trainers during winter months used the stretch of beach we were on to trot their race horses up and down the firm sand. Living at Pine Point during the winter months brought about a lot of respect for how the fisherman and clam diggers earned their livings – very tough occupations. How could I not paint this fantastic little spot on the edge of the Atlantic Ocean. This was my first time painting rocks, and I loved the experienced – talk about an endorphin rush. While I see a few things I could go back in and change, for today I just hope you enjoy the view . . . This entry was posted in About Oil Pastels, OPs New Paintings and tagged Maine, Oil Pastel, Seascape. Bookmark the permalink. I love this painting. Everything is worked out in detail so good. Amazing rocks, for your first time !!! Great to see this from your kitchen window. Hi Petronette, so nice of you to comment that I really appreciate. Yes this was the first time painting the rocks, I spent a number of hours learning to how to draw and paint rocks and then really studied my photograph that I worked from to understand the shapes and nuances of the jetty boulders. Thanks! Jetties always seem to beckon one to explore them. You did a good job of capturing these. I don’t paint but I enjoy the work of others – especially yours. Enjoy the summer. Thanks for the recent stop and like at one of my posts. I like it. It’s been a long time since I last smelled the sea. Thank you for your kind comments, I know what you mean – smelling the sea and taste “real” clam chowder. Thank you for visiting and liking my blog – I love New Hampshire! So nice to hear from you, thank you for your wonderful comment! I really appreciate it. First time?!!! Nuh! They look great, Mary! Hi Marina, thank you very much. The rocks were the first time, but before I painted the scene I spent about 5 hours learning how to paint rocks and boulders – I can’t tell you how many painting sketches w/various colors and sizes I did. Painting rocks was always one of those subjects that totally intimidated me. I’m glad that -as you have seen for your self- there was no reason to be intimidated by them! Oh Mary, you’ve convince me! I ready to drive on up. I think it’s rather difficult to capture what one enjoys/loves most, but you seem to have done it here. A gorgeous painting. Thanks so much Elena, it was idyllic and will always be one of those memories that won’t fade. We were very lucky to have had the chance to experience living by the sea. It looks such a good place Mary and how wonderful are those memories you are sharing there with us . Quite fancied a trip to Maine and New England . Maybe one day . Hi Poppy – thank you as always for your generous comments! On those mornings when it was the sun was a brilliant coming across the waterway as you can imagine – a really gorgeous scene. It was the best way to learn about the area and man did we fall in love with this special place. You would not be disappointed in taking a trip to the New England states – so much to see and do. The further north you go, the more quieter and quaint it becomes. I hope one day you come over and take a holiday here! You are so welcome, but I’m the one thankful that you have stopped by. Thanks so much for your wonderful comments!! Mary what a superb paintings with such a great stroy. Hi Doron, so nice of you – thank you very much. Glad you enjoyed the painting and story – it’s a wonderful place. Great memories! Mary, It is such a privilege to be able to paint them so beautifully as you do too..
Makes me happy to hear from you Bob, hope you are well and drawing/painting up a storm. Thank you kindly for your wonderful comment. I’m so glad you enjoyed your trip to Maine – it’s still chilly huh? That’s too bad, but it will warm up from now until end of August and then pouf old man winter is back. Things are well – blog is good and am in the process of setting up my website to sell cards, prints and some originals. Thanks and take care . . .
Oh, I definitely did enjoy this view…and the story, too! That’s my kind of place. Well, maybe minus the cold. 🙂 Your very first seascape painting? Wow! No wonder you wanted to continue with them. And I’m so glad you did. I enjoy every one!! Thanks Cyndi! If I lived at the ocean again, that would be my only subject – it’s alive and always changing. One can thank Mother Nature for that. We would spend every Sunday at the water, and when we lived in this area we’d walk the beach for hours. It’s one of the places, you don’t know what you have until it’s gone. P.S. We arrived in Maine during the month of February, so the cold was the most bitter – icy cold I’ve ever felt. It was one of those days when the clam diggers were in the ocean waters (tide was out) with their winter gear and boots – the site was amazing and showed just how back breaking the work was, despite the numb-cold temps. Lovely view, Mary and I can see why you fell in love with the place. We know that area as we spend some of every summer on the Maine coast. Thanks Pat so much, you guys are so lucky to live so close that you can go every year. My husband and I would be there several times a year if we could – we are aching to get back and just enjoy a real good cup of clam chowder and fresh fish sandwich! Can you tell I miss it? Hi Mary, thank you so much for sharing this! It’s beautiful. I love the action in the sky and the water is amazing! It looks like a photograph to me. The rocks are incredibly detailed. Maine has always held a special place in my heart. I’ve not been there, but from books and movies and my love of lighthouses and rugged shores, my fascination with the Appalachian trail ending there at Mt. Khataden (sp). It must have been a true joy to live there along the coast. Scott, one day you and the family need to make a trip up there – it is so worth the time and effort (cause the drive is long . . . ) But the coastline and little towns along the way are places that you could get lost in and never want to return home. Acadia National Park has the most amazing hiking trails – we spent vacation every summer up there, why go anywhere else. The best time to go are the first two weeks in August for the weather, come the third week it starts to get a little cold again and then by the end of August you can feel the winds change again. The whole State should be a national treasure. Thanks for your wonderful comments on the painting. OH How I know so many of these New England Jetty’s either fished off them or took many shots from them. Love hunting around those rocks for TREASURE too. Very nice painting Mary. How cool is that! Don’t you just love the area – there’s nothing like the Maine Coast. We used to go to the Clam Shack all the time. Those rocks were just gorgeous in person – all shapes and sizes, with amazing range of colors. The beach though – oh man I found buckets full of sand dollars – amazing place. Thank you for your great comments! We have a jetty here too down here in Florida…it always makes me give out a happy sigh! You made me smile, calling it the love shack…this is what we call our home♥ I am so glad you are sharing your fantastic passion with us. HI Laurie, Know kidding?! I miss the area so much, it was one of the most relaxing environments I’ve ever lived. Well I called it the “love shack,” my husband has another name for it!! Thank you and so glad you liked the painting!